Asscher cut engagement rings are stunning beauties that are growing more popular in every price range. If you're considering this beautiful cut, it's good to understand a bit about the purchasing and design options for your engagement ring. David Levy of David Levy Diamonds & Fine Jewels, Inc. shares his expertise about these unique stones and how they can best be displayed in a gorgeous ring. David consults with one of his cutters. 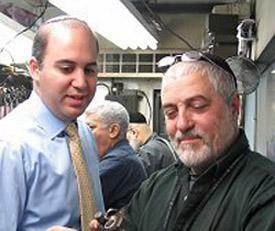 David Levy is a third generation jeweler with extensive experience in fine diamonds, particularly with Asscher and other unique cuts. If you're considering an Asscher cut diamond, his advice can help you choose the right stone and setting. LoveToKnow (LTK): How does an Asscher differ from princess or emerald cuts? 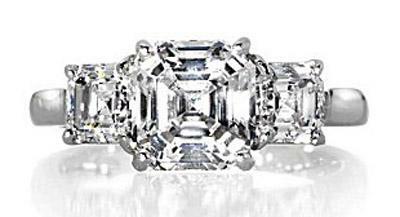 David Levy (DL): It differs greatly from a princess cut. If cut properly, an emerald cut will resemble an Asscher cut in everything but the square versus rectangular shape. Unfortunately, too many emerald cuts are poor, resulting in consumers getting turned off. LTK: The quality of the cut is a major factor in diamond value. How can a couple identify a quality Asscher cut? DL: Ask to see a selection of loose Asscher cuts in your budget, but in different sizes and qualities. After you see several diamonds, you can determine with your own eye whether one stands out as more beautiful than the other. I can't stress this too much: do not buy an Asscher cut diamond without seeing it in person next to other loose diamonds. There are several ways to cut one, and no two diamonds will look the same. After 18 years of manufacturing and importing all shapes and sizes of diamonds, I would never buy a diamond sight unseen! A well-cut Asscher cut has a feel to it. You can see the well defined facets that come from properly angled steps. Its outline is symmetrical. Its corners are well pronounced, and its girdle is not too thick. The reflection you see from the steps is like a house of mirrors: endless. LTK: It seems like retailers are offering more Asscher cut diamonds. How has the popularity of this cut changed in recent years? DL: Many more consumers are aware of the Asscher cut and ask for it when they shop. I think it will stay popular for many years to come. 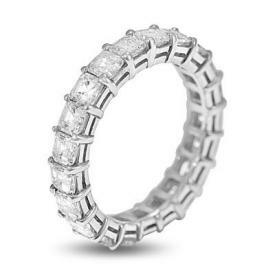 It won't unseat the rounds as the number one selling diamond, but is a beautiful alternative to the emerald cut. LTK: Every diamond shape has some settings that show it off better than others. 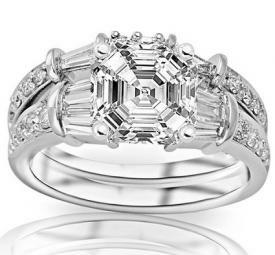 What is the best setting to show off an Asscher cut? DL: Choose a setting that is open, not too busy. The Asscher should shine, not be over-powered. I believe the best way to show off the Asscher cut is in a three-stone setting with either Asscher cuts on the sides or tapered baguettes or bullets. These rings are classics and will never look dated. A good amount of manufacturers set Asscher cuts in settings that have small rounds that are pave-set in the bands and sometimes around the center too. I make these rings as well, but it's not my first choice. I feel there's too much going on with most of those designs. We suggest designs to our clients, but the client always makes the final decision. LTK: Are there any poor setting choices for Asscher shapes? DL: Two things to definitely stay away from are (1) setting an engagement ring with the Asscher cut in a bezel setting and (2) setting trillion-shape diamonds on the sides. These two ways kill the beauty of an Asscher. LTK: Is it true that an Asscher cut is more expensive than some alternatives? How can a couple offset the expense of an Asscher cut? DL: An Asscher will cost more than most other diamonds and will look smaller than many other shapes. But the bonus is that people will look at the diamond and saw "Wow! I've never seen that before, what is it?" and "Look at the way it sparkles." Personally, I don't believe a consumer has to buy a colorless diamond. If you get a properly cut Asscher you can drop to a VS1 or VS2 clarity and G-H color. I rarely meet people who think their diamond is big enough. I recommend buying a quality diamond and asking about the seller's trade-up policy. Most stores have one and it will allow you to get a larger diamond down the road, always keeping the quality high enough. LTK: You specialize in matching diamonds. Why are matched gems critical to a well designed ring featuring Asscher cut diamonds? DL: Because of the unique brilliance of an Asscher cut, when you position other Asscher cuts next to it, it is essential the diamonds are cut the same way - table size, corner size, angles of steps. Also, the color of the diamonds has to match perfectly, as well the actual dimensions. Otherwise you'll destroy the beauty of the whole piece. If even just one out of 20 diamonds is off, you will lose the whole symmetrical feel that makes the Asscher cut beautiful. LTK: Besides engagement rings and wedding bands, what other types of jewelry use Asscher cut stones? DL: Because we cut Asscher cuts from .10 carat to 7.00 carats, we design and manufacture hundreds of different jewelry designs. We sell a large amount of eternity and partial-way bands with small Asscher cuts (.10 to .20 carat for each diamond) as well as larger stones (3/4 to one carat each). Whether you choose an Asscher cut diamond for your engagement ring or you pick an eternity ring set with several of these unique gems, you'll appreciate their sparkling beauty. This stepped cut offers classic style and incredible fire.